Taking inspiration from the vintage figure line, the old mini comics, unused concept art, and even a sprinkle of bits from the live action movie, Mondo's Masters of the Universe 1/6 scale figure line is an exciting new take on these classic characters. 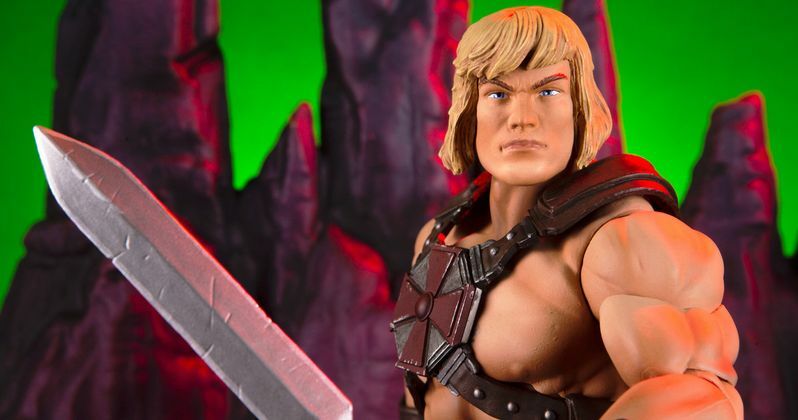 He-Man features over 30 points of articulation, fabric costume elements, and a whole host of accessories. It's the most powerful figure you will ever find, from here to Eternia! Several figures are soon to follow, including Skeletor, Man-At-Arms, Mer-Man, and more. To celebrate the new line, Mondo created a vintage toy commercial that serves as both a fun nod to the past and a look at the future. Obviously honing his craft back in the day with the Truck Guy Action Cereal commercial, fans of Otterbacher's directing chops get a heavy dose the filmmaker's style in this retro throwback ad. "The concept was to do an almost shot for shot recreation of one of the vintage Masters of the Universe commercials for the 80s, the twist being that the kids in those old commercials grew up, along with the Masters of the Universe figures they're playing with!" said Otterbacher.